Stubby Double Ball Torque L-Wrench Set, 13 pc. Bondhus 67037 - Stubby Double Ball Torque L-Wrench Set, 13 pc. You've never had a better set of hex wrenches than these! 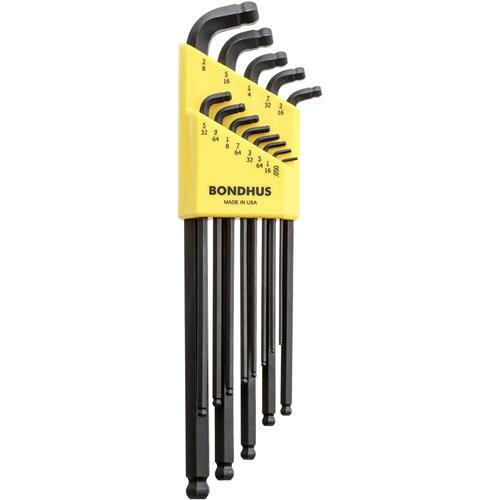 The Bondhus Stubby L-wrenches have a 100° angle rather than the standard 90° , which allows them to get into tighers spaces with a 15° working angle. The long arm end gives a 25° working angle for those harder to reach places. The ball ends deliver 50% more torque than conventional ball ends due to Bondhus' exclusive MaxTorque design – in addition they are made of high torque steel with twice the wear resistance. These L-wrenches also feature a corrosion-resistant finish to keep your tools safe and clean for years to come. Includes sizes 1/20", 1/16", 5/64", 3/32", 7/64", 1/8", 9/64", 5/32", 3/16", 7/32", 1/4", 5/16", and 3/8". I bought this set for 1specific size (5/32) to adjust the running block set screw below the table of a Delta band saw. It works great for this.